I spotted these amazing "secret boxes" at a flea market during my trip to Honolulu a few weeks ago and knew I couldn't leave without them. Each one is handcrafted using different layers of wood from the island and polished with lemon oil. 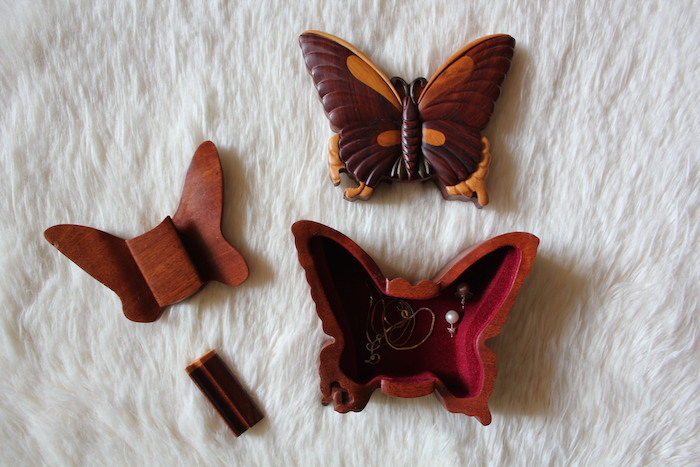 To unlock the butterfly box, you pull out a little slot of wood from the lower left wing. Instead of lifting the lid off, you have to slide it upward along a column of wood. Then you lift off the second lid, revealing the inside, and in go your treasures. They're actually pretty tricky to figure out when you first pick 'em up. Can you spot the lock on the owl?